The Quick Red Fox - Manchester Fashion, Food and Lifestyle Blogger, UK: Sweet Charity! I thought I'd do a little haul post as I've been a bit quiet on the blog lately and sadly haven't been up to much of interest! I have, however, managed to pop into a few charity shops here and there. The charity shops I visit now are mainly around Manchester, though I had a trip down to Warwick recently (the boyf's hometown) where the charity shops are amazing- and so many! He isn't really fond of being dragged round them though so only popped into one or two. Here's a few bits I've picked up recently. The black rucksack bag is one of my favourite bits. I'm going on holiday next week (totally not prepared!) so this will be perfect for throwing on to walk into the town. Sorry for the very un-blogger like photo with not an ounce of makeup other than a test slick of my new lippy (Rimmel Kate Moss collection in 12) and the front of my hair piled up in a hair clip! I also love the little Sekonda watch which was £3. I don't think that the leather strap is the original (says 'Apollo' on the inside) but the face is so pretty, you can see all the inner workings. Other vintage buys include a fancy silk jacket, a floral blouse, crocodile-effect leather purse, a £1 St. Michael sheer top and a big mohair cardy. In other news, you may have noticed that I've added a 'shop' link to my blog tabs. I'm feeling a bit inspired to start selling at the moment. I've always fancied an outlet to sell the amazing things I come across that maybe don't fit me so I can't get them for myself, or stuff that I make and DIY. One of my good friends has recently set up a vintage company (see it here) and with other bloggers starting their own shops I thought, why not! You'll see there's nothing in it at the moment; I'm playing around with the set-up. A lot of bloggers seem to use Big Cartel or start an eBay shop but as I just want to test the water, I don't really fancy paying a monthly fee. I found some coding to create items which link to a Paypal checkout so that's what I'm trying at the moment. If anyone knows of a Blogger plug-in or anything else which could work please let me know! I've got that holiday feeling so I'll leave you with this! 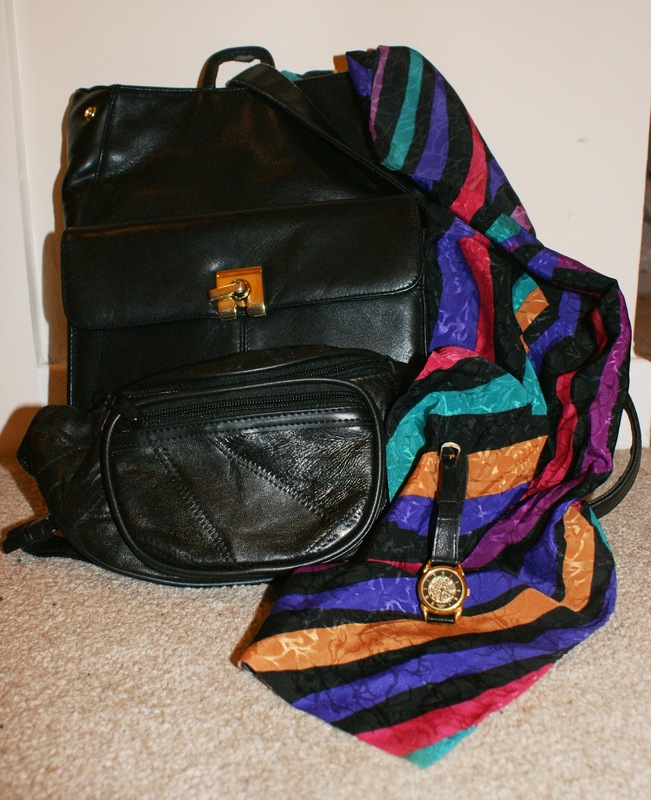 There's nothing like a thrifty charity shop haul to make yourself feel better! CAN'T BELIEVE HOW CHAP THAT BAG IS! Such a bargain! And love your blog too btw :) Got to love the northern blogs. Love that haul, the watch is so cute. I am toying with the idea of selling on from my overflowing cupboards- I would probs just take the easy ebay route... kudos for setting up your own shop!